Over at ESPN, Matthew Berry likes to remind readers (and listeners, and viewers … man, he’s everywhere) that, while we play fantasy football all season long, at its core, this is a weekly game we play. And yet, all too often we look at full-season numbers — points-per-game averages, or end-of-season rankings, or anything else that reflects how a player did cumulatively and ignores week-to-week vagaries in scoring. For most players, the distinction doesn’t matter that much. A guy who puts up 9.5 points a week but 14 once really doesn’t matter that much. But for some players, the difference between “season-long game” and “weekly game that yields season-long totals” matters. So today, I’ll be looking at the players whose seasons look significantly different if you take out their top game. Yes, every game, even a player’s best game, matters, but if we’re going around saying a guy averaged 10.2 points a week when he put up one 30-pointer and a bunch of 8-pointers, we’re sort of lying. So below are the players at each position whose best games of the 2017 season most influenced their fantasy ranking, and what we can learn from the differences. In the 2016 season, Carr finished as the No. 13 quarterback in fantasy points per game, partially by virtue of a 38-fantasy-point Week 8 game. Without it, he was the No. 20 quarterback. That game highlighted last offseason’s version of this piece. This time around, it was Week 7 instead of Week 8, but the same general point holds true. Carr rode one huge game most of the way to his end-of-season finish. Carr averaged 14.7 fantasy points per game (25th among quarterbacks), but without his 417 yards and 3 touchdowns in that game against the Chiefs, he fell to 31st in per-game average, just behind Jacoby Brissett. The conclusion: Personally, I’m not investing in Carr at all, and not just because of this — he’s not shown himself to be a fantasy difference-maker beyond a few games a year. But that does make Carr an interesting occasional DFS option if you can take advantage of those few games. It’s only natural that players who played in fewer games would see a single game mess with their score more than those with a larger games-played denominator, but it’s still surprising to see Watson on the list, given how well he played over almost all of his starts. 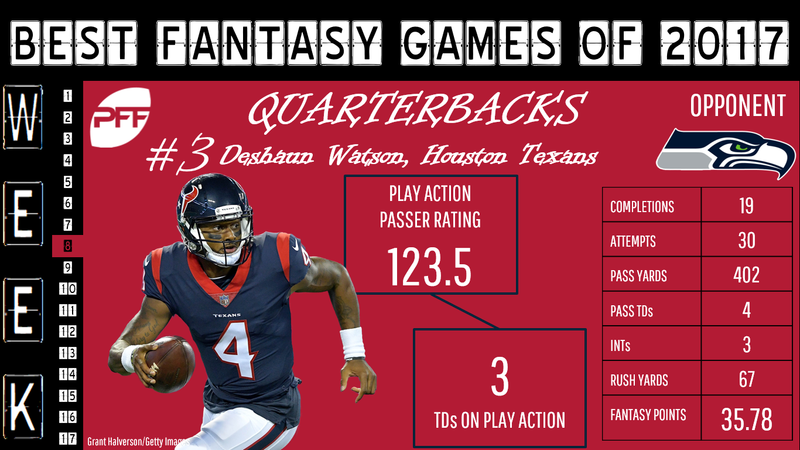 Even taking out his huge Week 8 game against Seattle, Watson had the best per-game fantasy average among quarterbacks last year. The conclusion: Nothing. Watson’s per-game stats are pulled down a bit by his backup appearance in Week 1, but regardless, wherever you would have ranked Watson without his name being here, keep him there. 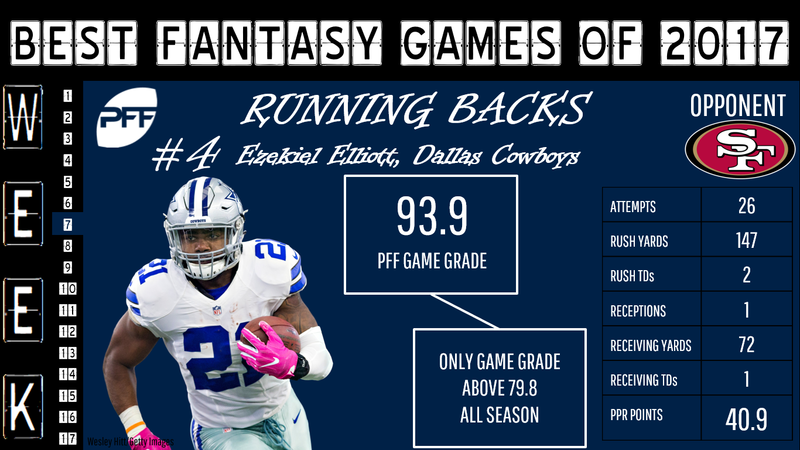 Elliott was still an easy RB1 even without his monster Week 7 against San Francisco, when he had 219 yards from scrimmage and 3 total touchdowns. But removing that game from his season dropped his per-game averaged by 14.3 percent. Thus far in his career, Elliott has proven to be the ideal sort of fantasy player — a high floor, and an exceptionally high ceiling. He’s played 25 NFL games and only once has he failed to reach double-digit fantasy points in standard scoring — Week 2 of 2017, when he was held to 8 yards rushing and 14 receiving. The conclusion: Elliott is one of the two or three safest running backs in the game. 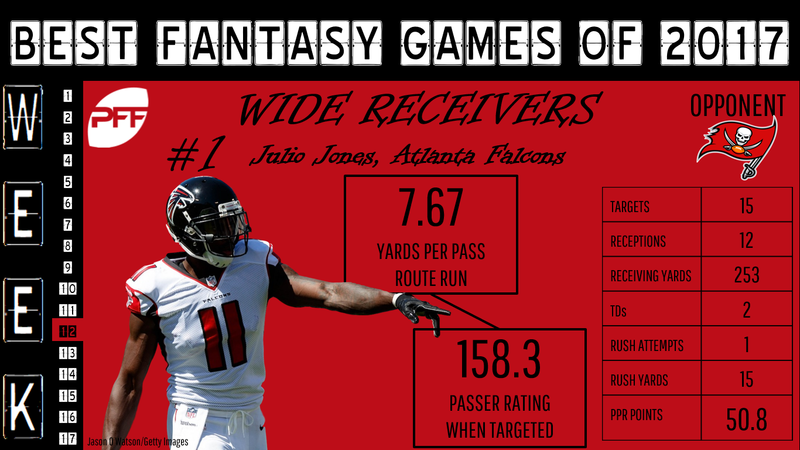 His lack of elite receiving numbers — he was only 25th at the position in targets per game — will make it difficult for him to regularly blow away the competition and be the overall RB1, but he’s as safe as anyone to be inside the top five. Stewart was only barely fantasy-relevant in his final year in Carolina, finishing the year as the No. 36 back on a per-game basis, but without his 103-yard, 3-touchdown Week 14, Stewart falls all the way down to 49th, tied with … Doug Martin. Stewart’s inclusion here is in part due to the fact that, by and large, running backs don’t have significant single-game swings and maintain regular work — the ones who play all year see regular touches and therefore see reasonably consistent scoring. This sort of study sees more impact on the pass-catching side. The conclusion: Stewart’s on the Giants now, where Dave Gettleman said “he’s hardly lost anything,” and … well, that’s a nice thing to say, but the Giants will be glad Saquon Barkley is around, and fantasy owners can safely ignore Stewart. This has to be the least surprising appearance in this piece. Cooper had back-to-back thousand-yard seasons to start his career, then cratered in 2017, finishing as the No. 27 wide receiver in points per game. Without his insane Week 7, though — when he had 210 receiving yards and scored 2 touchdowns — Cooper would fall to No. 54. That game accounted for two of his seven scores on the season and more than 30 percent of his receiving yardage. 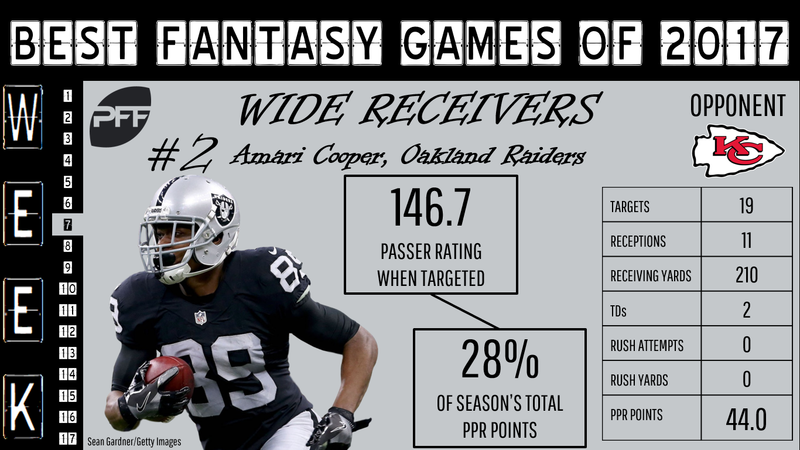 Cooper was drafted as a borderline WR1 last year, then failed to have even 35 yards in eight of 14 games. He only topped 66 yards twice all year. The Raiders faltered from top to bottom in 2017, but it started at the top with Cooper and Carr. The conclusion: Cooper saw one of the biggest dropoffs in PFF grade from 2016 to 2017 (82.2 to 51.9), so you’d almost have to expect a rebound in 2018. We really don’t know what to expect out of new teammate Jordy Nelson at this point in his career, either. Drafting Cooper as a sure starter in 2018 is risky. He’s more of a flex play, albeit one with truly elite upside. Jones is the poster boy for the monster single games. He’s had at least one game of 150-plus yards and/or multiple touchdowns every year of his career, even the abbreviated 2013 when he played only five games. The problem in 2017 was that Jones didn’t surround his monster game with huge other games. For example, in 2015, Jones had 164 yards and 2 touchdowns in Week 3, but he also had a game with 141 and 2, a game with 161 and 1, a game with 178 and 1, and several other dominant outings. In 2017, though, he had Week 12 (268 yards and 2 touchdowns), but only scored one other touchdown the entire rest of the year, and only had three other hundred-yard games. All told, Jones still finished the year as the No. 5 receiver in standard leagues, but his route there was frustrating. The conclusion: Honestly, Jones’ appearance here makes me like him more for 2018. Assuming health, his target share won’t see more than a negligible change with the change from Taylor Gabriel to Calvin Ridley, and his touchdown luck more or less has to improve. Jones is going to be behind Antonio Brown and DeAndre Hopkins in most rankings, but after that, it’s him or Odell Beckham Jr. for third. Outside of his Week 7 game against Buffalo, Howard’s season bests were 4 catches (Week 15) and 63 yards (Week 4). In that game, though, the rookie had 6 catches for 98 yards and scored two of his rookie year’s six touchdowns. Howard had the 11th-best per-game average among tight ends, but take that game out and he falls to 20th, behind Benjamin Watson and others. 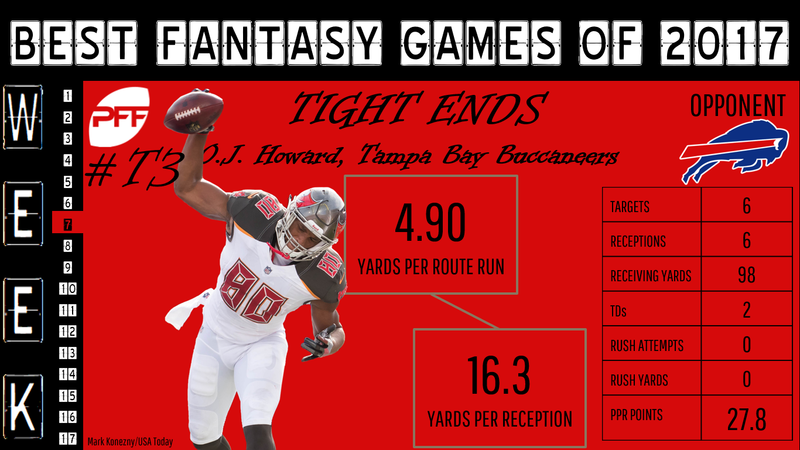 The conclusion: With the Buccaneers re-signing Cameron Brate this offseason, Howard still isn’t likely to emerge as a full-time regular fantasy starter. He makes sense as an occasional DFS option (especially if Brate misses a game — though he was active against Buffalo), but I prefer a more solid role from any tight end in my season-long leagues.